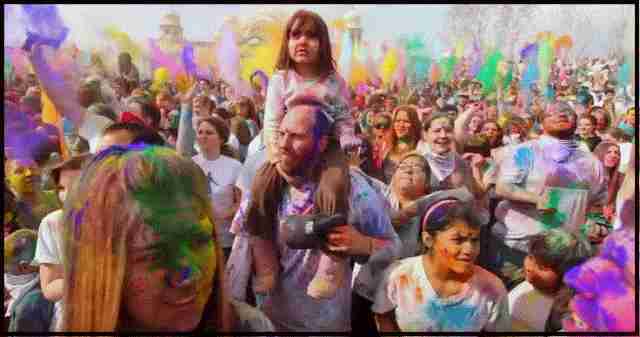 That color enters your body through your skin cells and mixes with blood. The chemical color contains mercury and other substances on a large scale and produces cancer and other diseases. A large number of people are affected. Basically, Indian people play color on holi and use chemical based color. That color is not completely herbal. Indian market produces a large quantity of chemical based color to fulfill the market needs. These colors attract people, the lowest price rate is also playing a great role to attract people. If anybody uses these colors, they face problem to eradicate these colors from face and body skin. You can protect your skin by below-given tips. When you want to use colors, just interpolate olive oil or coconut oil on body skin. That will help to eradicate chemical color from your skin at the time of wash. Rest of color will be eradicated by below-given tips and packs. 1. Curd With Gram Flour Mixture - If your skin is dry then chemical colors may make that drier. To eradicate these chemical based color from skin, get 2 tablespoons of gram flour and 2 tablespoons of curd and mix all with rosewater (Gulab-Jal). Now just spread this pack on an affected area. Leave this paste 20 minutes and wash with simple water. That will protect your skin and remove color. 2. Honey With Almonds Mixture - These mixtures helpful to eradicate colors as well as glow skin. Just convert almonds in powder and mix with honey, lemon juice and milk then use on the collared area. Wash this dry mixture with simple warm water. This will enhance the glow and reduce the dryness of skin. 3. Lentils (masoor dal) with Orange Peel - If your skin is oily then lentils and the orange pack is very useful to remove color. Grind mixture of dry orange peel and lentils and ready your paste with rosewater (Gulab Jal). Now spread on the affected area. Wash this dry mixture after some time. This will also help to reduce oil of your skin. 4. Useful Banana Pack - Take a ripe banana and mix with milk and honey and use on skin. Wash this mixture after some time in the warm water. Your color will remove and skin will soften. This pack is very useful to eradicate Holi Colours too. 5. Gram Flour With Rice Flour - Take an equal amount of gram and rice flour in the utensil. Now mix 1/2 tablespoon Turmeric powder with water and rosewater and ready a pack. Use it on the affected area. Help to recover your actual skin color with softness. Turmeric is good antiseptic. This pack also protect your skin form rashes. 6. Lemon Juice With Aloe-Vera - Aloe Vera is very much effective and good for skin nourishment. The mixture of lemon juice and aloe-Vera is very effective to reduce and eradicate spots on the skin. This mixture can use to rejuvenate skin after eradicating colors. You can purchase it from the market or can ready at home. Just take Aloe-Vera tree and collect all juice and mix lemon to make the pack at home. Use this mixture with the cotton ball at affected skin. Wash after 15 to 20 minutes by simple water. 7. Multani Soil - No additional component is required with this soil to provide good results for the removal of color. Just mix the water with Multani soil and ready a pack and spread on the skin. When pack will dry, wash this mixture with warm water. This mixture will also help to reduce extra oil from your face and skin. Very useful component for oily skin. I think these tools reduce your worry on Holi Eva. 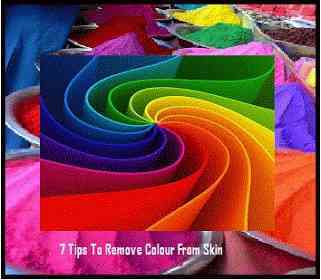 7 best way to protect your skin and eradicate chemical color from the skin by natural method. Share these tips with your colleagues.